Pharmacy Purchasing & Products: What is Cone Health’s approach to ensuring USP <800> compliance, and what role do CSTDs play in this strategy? Adam Peele, PharmD, MHA, BCPS, BCOP: At Cone Health, we are taking a global-systems approach to USP <800> compliance, to ensure that compliant practices are consistently implemented across the entire system. We began by conducting a gap analysis to identify all areas that require change. A 2-day LEAN event was held wherein stakeholders from all relevant disciplines, including environmental services, risk management, employee health, pharmacy, nursing, and nursing administration, received USP <800> education and identified gaps in practice. As an example, the gap analysis identified that various types of chemotherapy gloves were being used throughout the organization. Standardizing the type of chemotherapy glove used was one of our goals, so we identified our preferred type (ASTM D6978) and implemented their use throughout the health system. Utilizing a closed system drug-transfer device (CSTD) for hazardous drugs (HDs) is essential to preventing staff exposure. Because Cone Health has used CSTDs for preparing and administering antineoplastic medications for more than 10 years, we were quite comfortable with the USP <800> recommendation to use CSTDs during compounding and the requirement to use CSTDs during administration where the dosage form allows. We already require CSTD use for both compounding and administration of all HDs. Nevertheless, reviewing our current practices did give us an opportunity to fine-tune some areas, such as CSTD staff training. Part of Cone Health’s comprehensive strategy to achieve USP <800> compliance includes the use of IV robotics to produce many of the ready-to-administer (RTA) syringes utilized for our patients. Looking to the future, Cone Health’s flagship Moses H. Cone Memorial Hospital plans to implement IV robotics to batch-prepare primarily non-hazardous RTA syringes for use throughout the health system. To prepare for this endeavor, Moses Cone is currently undergoing renovations to become compliant with USP <800>. The health system’s largest cancer center, which moved into a new space in October 2018, is already USP <800> compliant from a facilities perspective. One HD robot is utilized to compound chemotherapy at the cancer center, with plans to add a second HD robot at one of our other facilities in early Spring 2019. Even with extensive robot use, there will always be some HD orders that will require manual preparation, and thus need CSTDs. Rush chemotherapy orders, for example, are typically compounded manually using a CSTD, as putting them into the queue for robotic compounding can take more time. PP&P: How does Cone Health stay abreast of new technology developments with CSTDs? Peele: When evaluating CSTDs, involving input of the entire oncology pharmacy and nursing teams is essential. The end users who will actually be using the device must be instrumental in the selection process. Ten years ago when Cone Health was initially choosing a CSTD, pharmacy technicians and nurses significantly influenced the choice of the product ultimately selected. Including end users in the evaluation process helps ensure the selected device will be used as intended; consequently, end user preference was an important factor in the decision. In addition, the evaluation team reviewed extensive data on each device available in the marketplace and networked with other facilities that used these devices to help decide on a CSTD. Pharmacy and nursing keep informed of new CSTD approvals as they occur, reviewing the available clinical data supporting use of each device. If warranted, we invite vendors to visit the facility to demonstrate use of their device. Because the health and safety of our employees is the most important consideration, the first feature we evaluate is whether the CSTD is truly closed; the vendor must provide compelling clinical data to support this claim. Secondly, we look at device cost. To ensure a fair comparison, we consider our current and anticipated volume of use, our existing CSTD expenditures, and the total cost of the new device. If we decide to move forward, an in-service and a pilot study at all of our cancer centers is conducted to solicit technician, pharmacist, and nursing feedback on the strengths and weaknesses of the device. A full analysis is required for every CSTD that we pilot. We continue to use the same CSTD today that we selected 10 years ago. PP&P: What impact does USP <800> have on staff training? Peele: As part of the preparation for meeting the December 1, 2019 USP <800> deadline, facilities should review their training practices. In the past, we primarily took an observational approach to CSTD training. 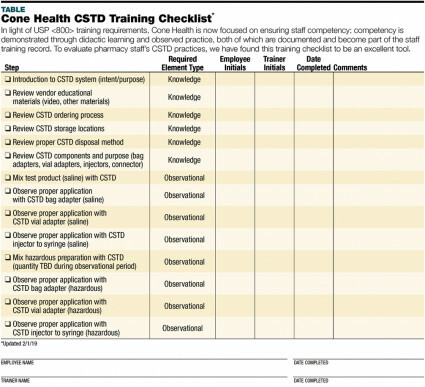 A vendor representative would visit the facility to demonstrate compounding and administering HDs with a CSTD; thereafter, pharmacy and nursing leadership would provide staff oversight, observing and correcting practice when necessary. In light of USP <800> training requirements, we are now focused on ensuring staff competency; competency is demonstrated through didactic learning and observed practice, both of which are documented and become part of the staff training record. 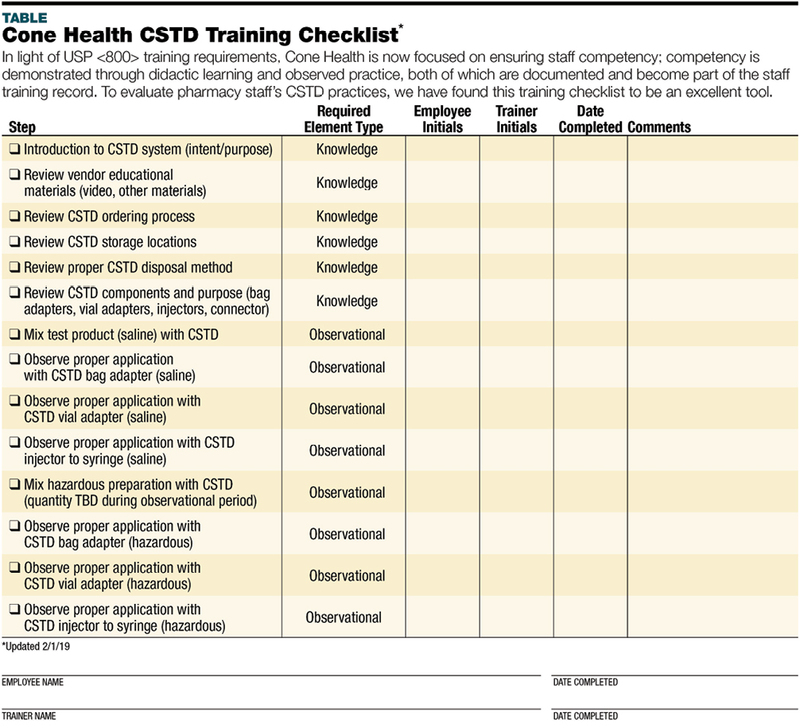 To evaluate pharmacy staff’s CSTD practices, we have found a training checklist (see TABLE) to be an excellent tool. One common misconception is that USP <800> impacts only pharmacy and nursing, while in fact, the chapter requirements encompass anyone who comes into contact with HDs, from the moment they enter the facility until the product is wasted. Therefore, education should be provided to staff members who unload HDs on the dock, couriers who deliver HDs, and environmental services staff who clean areas where HDs are prepared and administered. PP&P: How can pharmacy gain buy-in from administration to support safety initiatives, including CSTD use? Each entity must have a designated person who is qualified and trained to be responsible for developing and implementing appropriate procedures; overseeing entity compliance with this chapter and other applicable laws, regulations, and standards; ensuring competency of personnel; and ensuring environmental control of the storage and compounding areas. The designated person must thoroughly understand the rationale for risk-prevention policies, risks to themselves and others, risks of non-compliance that may compromise safety, and the responsibility to report potentially hazardous situations to the management team. The designated person must also be responsible for the oversight of monitoring the facility and maintaining reports of testing/sampling performed in facilities, and acting on the results. As part of the compliance effort, organizations must assign a specific individual to serve as the HD designated person, who is responsible for certifying that all personnel who handle HDs do so safely by minimizing HD exposure and contamination of the work and patient-care environment. In addition, the designated person should also educate administration both on what USP <800> requires, and also why these safety initiatives are mandatory. Consider also identifying a senior executive leader to be the USP <800> executive champion. In this role, they can have regular conversations with their peers to ensure buy-in at the highest levels. It is important that the administration (as well as staff throughout the facility) understand that a commitment to USP <800> compliance is necessary to minimize the potential for adverse events related to the preparation and administration of HDs. The Cone Health pharmacy department is a dedicated advocate for safety initiatives, including promoting understanding of why USP <800> compliance is critical. In our experience, centering the conversation on pharmacy’s responsibility to keep our employees safe is a highly effective strategy. We have assigned one of our pharmacists to serve as the USP <800> designated person. USP <800> Hazardous Drugs – Handling in Healthcare Settings. First Supplement to USP 39-NF 34 Physical Tests. www.usp.org/compounding/general-chapter-hazardous-drugs-handling-healthcare. Accessed February 8, 2019. Adam Peele, PharmD, MHA, BCPS, BCOP, is the director of oncology pharmacy services and the PGY2 oncology pharmacy residency director for Cone Health in Greensboro, North Carolina. He obtained a doctorate of pharmacy from Campbell College of Pharmacy and Health Sciences and a Masters in Healthcare Administration from Walden University.